Englewood Votes & Ald. Sawyer Host Voter’s Reg. Drive at WBEZ! | R.A.G.E. Englewood Votes! 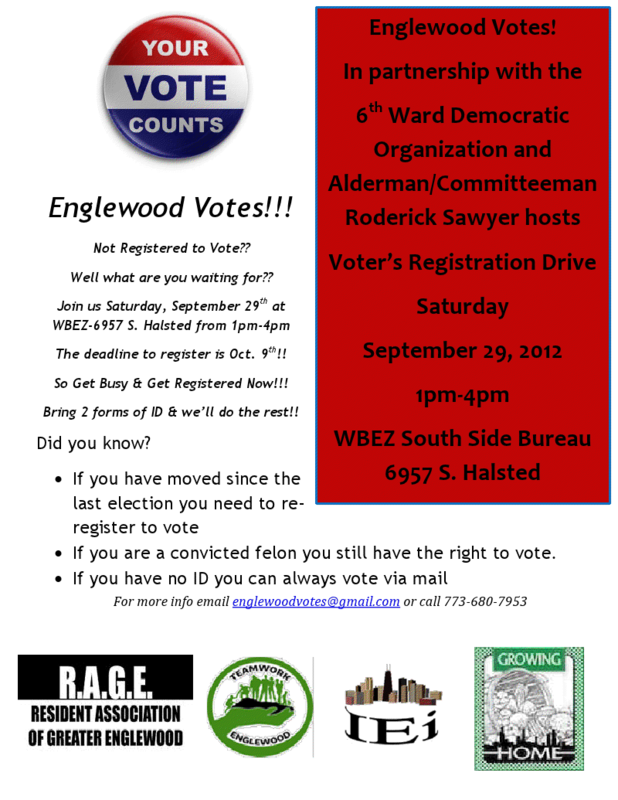 partners with the 6th Ward Democratic Organization and Alderman/Committeeman Roderick Sawyer to hosts an Englewood Voter’s Registration Drive this Saturday September 29, 2012 from 1pm-4pm at WBEZ South Side Bureau 6957 S. Halsted! Not Registered to Vote?? Well what are you waiting for?? Join us on Saturday, the deadline to register is Oct. 9th!! So Get Busy & Get Registered Now!! !